Boston in the 1800s was a reformer’s paradise. All of the major social reform movements – Temperance, Prison Reform, Abolition, Women’s Suffrage – had an advocate base in Boston. A common thread among many of these movements was no less a goal than the eradication of poverty, which was seen as the prime cause of crime, drunkenness and the other social ills. One approach was to raise the standards of cleanliness, nutrition and public health. The most innovative public health initiatives of the later 19th Century sought to reduce the incidence of disease by addressing the sources of contagion, rather than trying to alleviate the symptoms. Among these was the Pure Food movement, which held that greater cleanliness at the site of production (eg, the farms) would result in a cleaner food supply overall. This in turn would reduce the incidence of parasitic disease and food-borne illnesses such as trichinosis and tuberculosis. Many of the hygienic farming techniques developed in the United States in the last century are in use today by farmers in the developing world. Needham has been able to play a role in these movements because it has always enjoyed easy access to the business and intellectual resources of the greater Boston area. In Colonial times, the Charles River provided a link between the towns. After 1850, rail lines built to carry Needham’s gravel to fill the Back Bay fens also provided a convenient commuter route for a rising professional class. The construction of Route 128, “America’s Technology Highway”, in the 1950s carried the intellectual capital of the universities out to the land-rich western suburbs, to create a hub of technological innovation. This article will focus on Needham’s role in the Pure Food movement, especially the stock- raising experiments of William Emerson Baker, and the “hands-free” milking techniques developed by the Walker-Gordon Farms. Farming in Needham has always required some ingenuity. Tucked into a loop in the Charles River, Needham ground is low-lying and damp. The familiar English crops – wheat, barley and rye – could not thrive in Needham’s poor soils. Even Indian Corn, a staple of the new Massachusetts Bay Colony, had limited success. 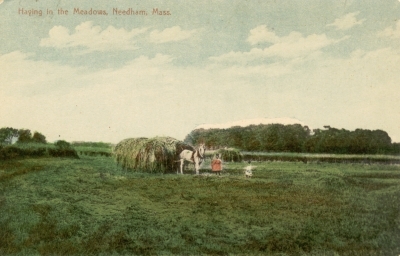 Instead of grain, Needham farmers relied upon the products more suited to their riverside lands – garden crops, hay, and especially cattle. 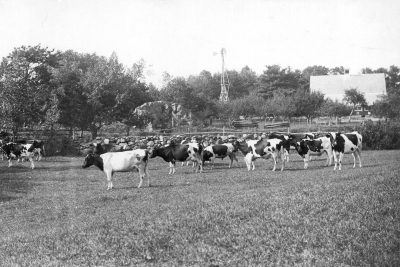 By 1900, there were eight commercial dairies in Needham, the mainstay of its agricultural economy. Founded in Boston in 1891, Walker-Gordon’s original product was not milk, but baby formula. Dr Thomas Rotch, pediatrician at the Harvard Medical School, determined that infant mortality could be greatly reduced by the scientific feeding of infants whose mothers were unable to produce sufficient milk. He turned to Gustavus Gordon, a scientist from Milwaukee, to develop a formula for modifying cow’s milk for infant nutrition. 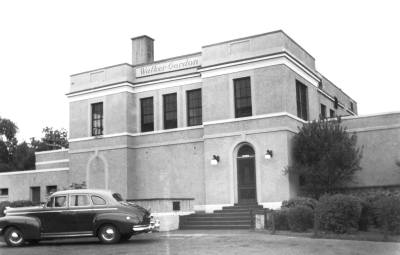 Gordon and his business partner, George Walker of Boston, established the first of several Walker-Gordon Laboratories at 203 Clarendon Street. From the first, the company’s main difficulty was obtaining milk of consistent quality and sufficient purity for infant use. Milk production and handling was not regulated, and much of the available milk was tainted with intestinal parasites or tuberculosis. In order to control the production of their own milk, Walker-Gordon purchased 140 acres of land in Plainsboro, New Jersey in 1897. On their farm, the cattle were maintained in an entirely controlled environment and fed on specially-grown feed. The milk was tested daily for bacteria and pathogens. Both cattle and dairy staff were given frequent medical checkups. As demand for their infant formula and their milk increased, Walker-Gordon purchased a second farm in Needham, off Central Avenue at Charles River Street. The company also developed technical innovations – such as the world-famous ROTOLACTOR – that allowed them to increase production of milk without compromising their standards of purity. By the 1950s, however, business began to fall off. Federal regulation of milk standards had reduced the need for Walker-Gordon’s stringent (and costly) cleanliness practices. Home milk delivery, upon which Walker-Gordon depended, was not as convenient for housewives as the supermarket. 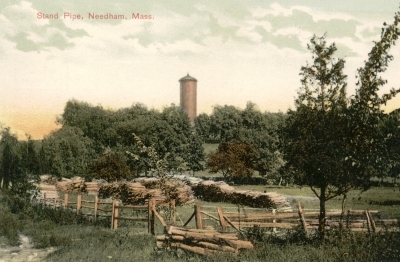 By 1960, the Needham farm had been closed, and the land was sold. The farm is now the site of The Walker Home and School. 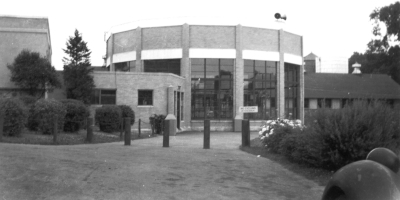 The Plainsboro farm was also sold, and the company closed its doors in 1971. The Rotolactor was one means that Walker-Gordon developed to speed up production and control costs while maintaining standards. 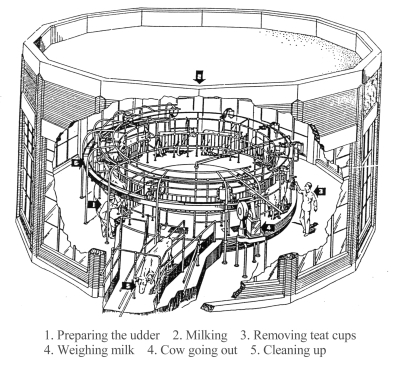 The Rotolactor was a completely “hands-free” milking system, a milking merry-go-round. The cows entered the Rotolactor and were thoroughly washed. After the teat cups were attached by a dairyman, the rest of the process was entirely automatic – milk was extracted, weighed and sent through a chilled tubing system to the processing and bottling facility without further contact with humans or air. The cow and the milking stall were washed down, and the cow released to her stall for feeding. The Rotolactor was developed at the Plainsboro farm in 1930. A smaller version was built and displayed at the New York World’s Fair in 1939. The World’s Fair machine was installed in the Needham farm in 1940, where it operated until 1960. In addition to the milking operation, the both the Plainsboro and Needham farms were public attractions. Visitors were permitted limited access to the cow barns, and could view to Rotolactor four times daily. Kids loved to watch the Rotolactor, and sample the farms’ dairy products and ice cream at the Dairy Bar. Walker-Gordon’s specialty products, such as Acidophilus Milk, were available to sample, and you could always take a quart of ice cream home when you left. William Emerson Baker was born in Roxbury in 1828. As a young man, he joined forces with a Boston tailor named William Grover, and together they formed the Grover and Baker Sewing Machine Company. The Company was phenomenally successful, and Baker retired in 1868, a very rich man at the age of forty. After retirement, Baker purchased nearly 800 acres in the southwest corner of Needham. In the twenty years that followed, Baker filled his summer estate, The Ridge Hill Farms, with as assortment of amusements, attractions and exhibits. Although it was widely regarded as an amusement park, Ridge Hill Farms was in fact the physical embodiment of Baker’s opinions – often radical and always provocative – on American politics and society. Baker was deeply committed to social reform; among the causes he supported were the reconciliation of North and South, the establishment of a public health service, religious tolerance, and funding for education institutions such as the Boston Museum of Art, the Boston Society for Natural History, the Boston Aquarium, and the Massachusetts Institute of Technology. The Needham Selectmen opposed Baker’s petition, and it languished in legislative committees for four years before it was refused. Needham was unwilling to lose Baker’s estate, which amounted to nearly 6% of the town’s taxable acreage. Furious, Baker accused them of “strangling the Child of my Heart”, and threatened to leave “Suicidal Needham” and establish Hygeria in another state – a threat he had not enough time to carry out before his early death in 1888. In June of 1875, Baker threw a huge party to celebrate the laying of the cornerstone for his new Sanitary Piggery. 2500 invited guests attended the event, including Governor Gaston of Massachusetts, Mayor Cobb of Boston, State senators and representatives, generals, members of foreign legations, and delegations of the 5th Maryland Regiment, the South Carolina Light Infantry, and the 5th Massachusetts Regiment. 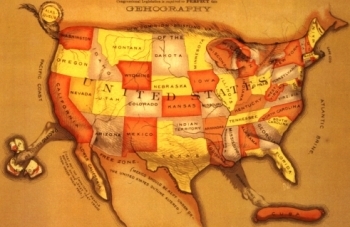 The PORCINEOGRAPH,or a pig’s-eye view of the Ge-HOG-raphy of the United States. Baker gave these to guests as a “Good Cheer Souvenir” of the Corner-Stone Piggery Party. Along with the Sanitary Piggery, several establishments on Baker’s estate were dedicated to the study and promotion of Pure Food principles. These were grouped into the southwest corner, in the area known as Mount Charity. The Massachusetts Institute of Cookery and the Ridge Hill Laboratories were established to develop and teach the methods of Sanitary Cookery, including the hygienic farming of livestock, the elimination of adulteration and additives in food, understanding spoilage and maintaining freshness, and the scientific principles of sanitary food preparation. Cooks trained at the Massachusetts Institute of Cookery were employed to cook for the guests at Baker’s various hotels and restaurants. The Hotel Wellesley was the very last word in luxury accommodation, with 159 guest rooms, 12 toilets and 5 baths. The main dining room could seat 600 people, and there were smaller rooms for private parties. The Trephis Home Hotel was a health resort, where guests could enjoy hiking in the pine woods and canoeing on the Charles in an atmosphere of clean air and pure water. Named from the Greek, trephein, to nourish, and phagien, to eat, the Trepho-Phagian Institute was a charity organization whose purpose was to “distribute the delicacies of sanitary cooking, &tc, to the invalid poor”. Funds for this charity came from donors, shareholders, and the proceeds from Baker’s hotels, resorts and restaurants.